They are becoming more common at an earlier age now. Many people think they are invincible from heart attacks so they don't exercise, and don't eat properly. However in the past couple months I have heard of cases dealing with people that I know where the fathers had sporadic heart attacks and died. The misconception is that people think that mostly men have heart attacks and they have them when they are older. However it seems that as time goes on, heart attacks are becoming more and more common at an earlier age. First off we should determine exactly what a heart attack is. So what exactly is it? 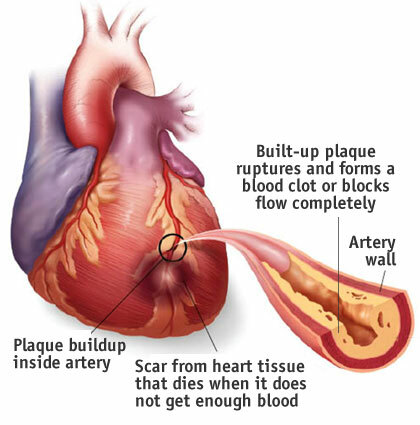 A heart attack occurs when the arteries are blocked off to the heart and blood cannot pump through. When the blood is blocked the heart is either damaged or dies, which determines if the person with the heart attack will survive or die. Although the genetics cannot cause a heart attack directly, if your family has a history of coronary heart disease or other things such as high blood pressure, you have a higher risk of having a heart attack. So...how do you prevent yourself from having a heart attack? If you have high blood pressure of other heart problems you can take medicine, eat healthy, exercise your heart. There are also many other prevention techniques such as quitting smoking, eating less sodium, and managing stress. - Heart disease is the number leading cause of death for men and women in the United States. -This year more than 920.000 people will have a heart attack. -By 2020 it is predicted that heart attacks will be the greatest cause of death throughout the world. Heart attacks are not something you should worry about all day, however it is important to take preventive steps in order to make sure that you do not fall victim to one. Eat healthy, exercise, and go to the doctor regularly so you do not become a heart attack statistic. Children now a days should go outside and get off the computer and off of the xbox. They should be outside or exercising for at least 45 minutes a day. I am sure while these kids are sitting inside playing on their technology they are eating junk food too. Kids should be active and have well balanced meals and not lose sight of their health at a young or old age.